← Fasting for (Which) Families: Commonsense Immigration Reform? Across year-end top ten lists from YouTube, USA Today, the Huffington Post, and others, Jack Hoffman has been making steady appearances. On April 6, 2013, Jack Hoffman, a seven-year old with brain cancer, donned a red #22 jersey to make a 69-yard touchdown during the Spring Game scrimmage for the University of Nebraska-Lincoln Husker football team. Since the Spring Game, the touchdown has garnered more than 8 million views on YouTube. It has been named the best moment by USA Today and the Big Ten and earned Jack an ESPY. While the touchdown itself allowed Jack to live his dream of playing with the Huskers, Jack and his family have also been using the opportunity to increase awareness of pediatric brain cancer and raise money for medical research. So far, The Team Jack Foundation has raised $1 million for cancer research through donations, the sale of Team Jack t-shirts and bracelets, and galas and bowling fundraisers. More important than making the top ten year end lists, Jack’s touchdown is significant because it has been fully integrated into the values, traditions, and meaning of what it means to be a Husker fan. Jack’s touchdown, and the Husker football team’s welcoming of Jack, has become a way to define what it means to be a Husker, identify Husker values, and prioritize those values. After the Spring Game, fans pointed to Jack to define what it means to be a Husker and to share pride in that identity. 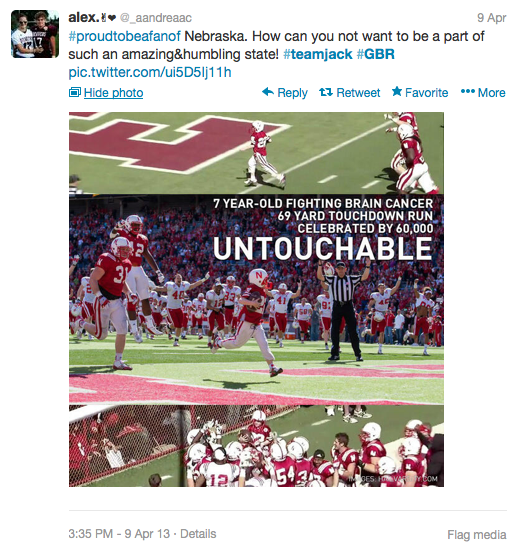 Throughout these tweets, fans share their pride in the Nebraska football program and allude to something special being shown with Jack’s touchdown. Jeff Koterba articulates what these fans leave unspoken: that Jack’s touchdown showed Husker values at work. 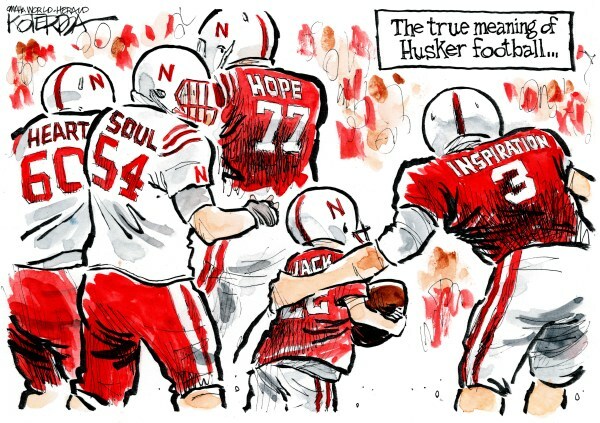 In Koterba’s cartoon, Husker football players are no longer students, athletes, or celebrities, but rather are representatives of the values upheld by Husker Nation. The editorial states, “It’s easy in today’s high-stakes world of big-time college athletics to overlook things like sportsmanship, generosity and inspiration. All suited up Saturday in Memorial Stadium.” Indeed, the cartoon shows what happens when Huskers values are enacted through the Husker football players on the field and the Husker fans in the crowd roaring as Jack crossed into the end zone. Husker fans like Sean Carey and Tyler Quick assert that these values are more important than any winning streak. 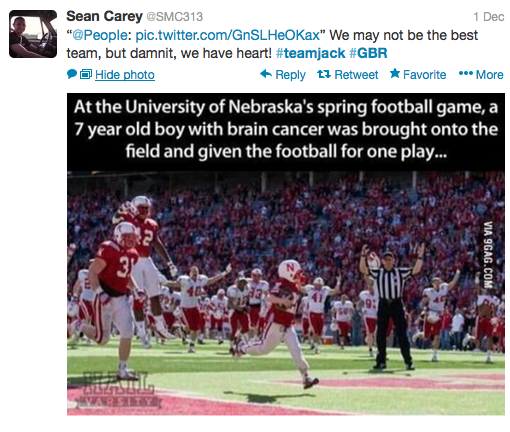 For Huskers, sportsmanship, generosity, inspiration, hope, heart, and soul are prioritized over winning. 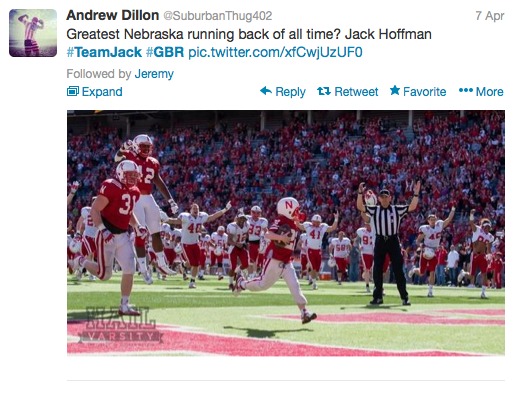 Andrew Dillon goes so far as to say that Jack Hoffman may be the greatest running back of all time. By doing so, he contributes to prioritizing the values Jack embodies over winning football games. Andrew shifts the criteria for best running back from touchdown statistics to the values Jack embodies. Jack’s single touchdown may be more important than Mike Rozier’s 29 touchdowns and 2,148 rushing yards. Husker fans have fully embraced Jack’s touchdown. For Huskers, it is a point of pride, shows what it means to be a Husker, and demonstrates that values like sportsmanship, hope, and inspiration are more important than winning. Of course, these values have long been a part of the Husker fan community. Tom Osborne, the Husker’s head football coach from 1973-1997, famously embraced a coaching philosophy that emphasized more than winning: a game well played. But after Tom Osborne stepped aside as head football coach, Husker Nation underwent a minor identity crisis. Frank Solich was hired in 1998 and found moderate success, but after a 7-7 season in 2002 and firing many of the assistant coaches afterwards, only one third of Nebraskans polled thought his team “represented real Nebraska football” (Aden, pg. 57). When Bill Callahan took over in 2004, he introduced big changes that yielded minimal success: he gutted Nebraska’s walk-on program and introduced a west-coast offense. Callahan was eventually fired in 2007 (Aden, pg. 58). These Solich and Callahan years shook the foundations of Husker Nation. Nebraska’s current coach, Bo Pelini, has been unable to repair all the damage—indeed, such a task may take years. 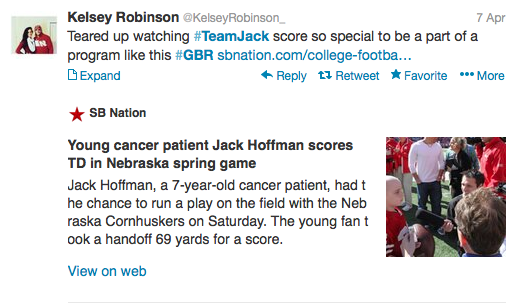 This makes Jack Hoffman’s touchdown even more important for the Husker fan community. His touchdown provided an opportunity for fans, players, and coaches to recommit themselves to particular values and reconnect those values to Husker fandom. When Jack made that touchdown, Huskers were reminded of what it takes to be a Husker and why that’s so special. Really interesting post! You ID “sportsmanship,” “hope,” “inspiration,” “generosity,” “heart,” “soul,” etc. as some of the core values that rest at the heart of “what it means to be a Husker.” Do you have a sense if these values were explicitly articulated by the team and/or its fans in some way before Jack’s touchdown run, or, if his story became a sort of an inventional resource, inspiring the team and its fans to redefine the meaning of the Huskers in the wake of some tumult? Also, is it possible to suss out how the team may have promoted this story as a branding/marketing tool? Have the Huskers stayed connected to Jack in any way, or, was his story more of a one-off Internet sensation? Almost nothing will get you more positive attention than doing something for a kid with cancer or other serious medical condition; however, I always wonder if there’s an ethical question that arises, e.g.) if making this kind of event so visible and using it to effectively strengthen a brand isn’t exploitative. These considerations may fall somewhat outside of your interest in fandom; however, I’d be really curious to hear what you think. Thanks! As an addendum to the above: “one-off Internet sensation” may have been a poor choice of words. The Jack Hoffman Foundation has raised a significant amount of money, and Jack and his family continue to advocate for pediatric cancer research in a variety of settings. (For example, Jack met President Obama in Fall 2013.) I think what I was trying to get at is the question of whether or not the Huskers have an ongoing relationship with the foundation or the family, or, if Jack’s touchdown run was more of a singular moment in the team’s history. Great questions Grant. Jack Hoffman has been spending time with the team pretty consistently over the last couple of years–watching them at practice, running onto the field with them during games, etc. His touch-down was just the biggest and most involved version of that. From what the Foundation has on its website, it looks like Jack has a pretty close relationship with Rex Burkhead, a former Husker player now in the NFL. The values of Husker fandom have been built over the last 50-100 years. Fans still quote an early name of the Husker football team (The Bugeaters), which signaled a kind of determination (early homesteaders were willing to eat bugs to survive the winter, rather than give up and head back East). And Tom Osborne’s leadership of the team emphasized character traits in really significant ways. Jack’s touchdown was a way to re-connect to those values. Huskers imagine themselves and their team as representing those values–and I would suspect they would be proud to market their team in that way.